This work, orginally written for the piano, consists of seven movements and has been arranged for other combinations of instruments in the past. However, this edition appears to be the first time this Borodin composition has been arranged for two guitars, a surprising fact in view of its very appealing eastern style of harmony work, very typical of Borodin at his best, and also because it fits almost untouched onto two guitars with very little actual arranging needing to be done. 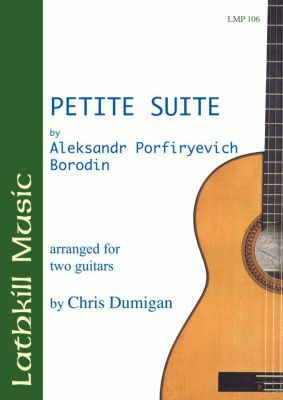 This extended work with its' beguiling melodies and wonderful harmonies should prove popular to any moderately advanced guitar duos seeking a new and refreshing concert item.